B0989. George Shea. 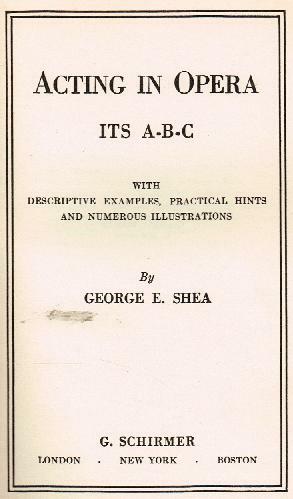 Acting in Opera, Its A-B-C. New York, Schirmer, 1915, Original Edition. 90pp. Charming Photos of acting poses. Superb copy, w.olive boards, has wee stain on front cover. 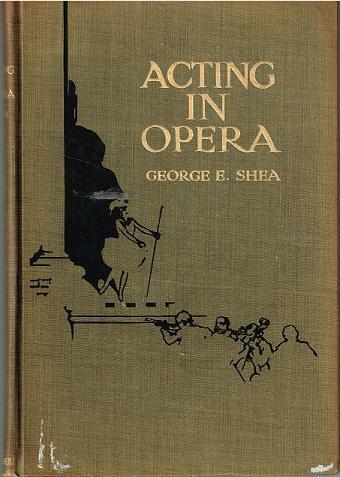 "ACTING IN OPERA by George Shea is a 1915 acting manual for opera singers. It marks the tail end of a long, unbroken tradition of acting books and rules that date from the 17th century. Amazingly, much of the advice and many of the rules in the text are taken almost word for word from acting manuals from the past 200 years - Franciscus Lang, Engels, Jelgerhuis and Gilbert Austin. This tradition has it's last incarnation in the stylized and quite beautiful acting style used in silent pictures - where the body was more important than the voice. Anyone with an interest in theatre history should take a look at this book - the illustrations are priceless - for a glimpse of a period when tenors were expected to do more than belt out high C's and sweat on cue."